What do I mean, only four years in Paris?! Yes, the sad reality is that after four life-changing years in France, we are moving to...Germany. It's mostly sad because we're leaving France. Germany itself is an exciting prospect for us, especially for two Americans who want to stay in the EU as long as possible! This whole summer has been spent networking, negotiating, and translating all of our possible options for this coming sports season. I did receive offers in France, but we couldn't justify putting Marc through another year of unemployment. Instead, Marc got a job outside of Munich, coaching basketball and doing his thing again. We are so thankful! I'm still working on what my job situation is going to look like. "Brainstorming" best describes my state of mind the past month, as Germany became our end-game. Volleyball, English tutoring, guiding tours (but, EW, snow?! ), and blogging have all come to mind. For now, the best idea came while I was floating in my parents' pool. I was reflecting on how this blog was going to take a Bavarian turn, and what a difference that would be from my Paris-heavy posts from the past four years. I was really glad I had the foresight to name my blog something neutral and not specific to any country or language. I was going back and forth from excited to experience new places to nostalgic about my happy times in Paris. Then the idea hit me. I interrupted my lazy California brainstorming, splashed out of the pool, and Four Years in Paris came to be. In the course of a week (but really, it took four years to do the bulk of the work! ), I learned everything I could about creating, formatting, and publishing eBooks. I edited, re-edited, had my grammar-wise mom and sister edit, and had my moments of wanting to destroy Kindle. It was a great and necessary experience. Compiling and reliving my Paris moments really brought me a sense of closure. I know we are doing the right thing by moving to Germany. Having everything I love about Paris in one file now makes it easier for me to move on. Learning about and falling in love with Paris has been one of my favorite journeys. It's been a journey full of surprises, both good and bad, but mostly, my Four Years in Paris documents the best years of my life...so far. Whether you do or don't download the eBook is not the point. THANK YOU for whenever you've joined me in Paris, in France, in Europe, or anywhere. What started as a practical way to communicate my European adventures with family and friends in the USA has become so much more, and has grown to include thousands of readers. 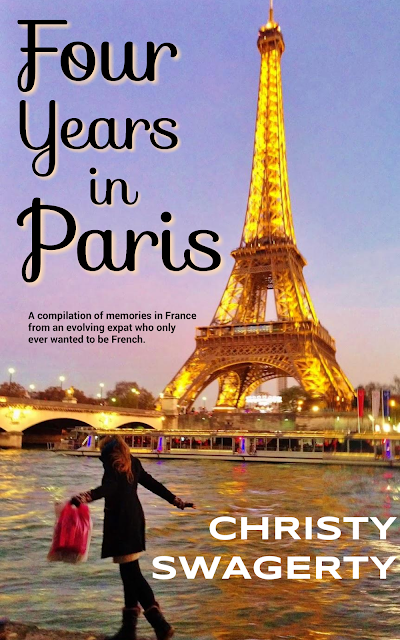 For those of you who do want to download Four Years in Paris, you can do that on the Paris eBook page or the Four Years in Paris webpage. For Kindle users, FYIP is available on the Amazon website as well. I hope you like the cover, the title, and the content. I thoroughly enjoyed putting it all together, and I'm so grateful I pursued blogging consistently to the point where an eBook was possible! What's up next for Swags? Germany, obviously. Spain is on the docket for Christmas again. I'd love to take Marc to Portugal with me in the spring. I'm planning on Budapest and Vienna, and hoping for Croatia and maybe Poland or the Czech Republic. Marc is insisting on Berlin. We won't be lacking for places to go, that's for sure! 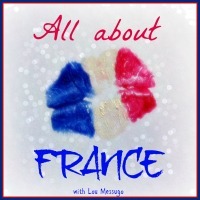 I'm linking up with #AllAboutFrance for the last time as an American living in France. I will still link-up with France posts, but it will now be as someone who used to live there. If you love France, you should definitely check it out! So you're telling me you're about to move to my favorite country??? I am so excited for you, even though the borders touch, it will be a huge change of pace and scenery. Haha, YES, we're moving to your favorite country! Oh yeah, we are prepping for feeling our limitations all over again! Let me know if you're ever in the Munich area! Congratulations on your book, Christy! While writing it, did you feel as if you were having an adventure inside of an adventure ~ that of being an American living in Europe? The experience changed my life, too. Hoping yours becomes even more interesting in Germany! Thank you, Melodie! I found myself laughing often as I read through my feeble first months abroad! I loved going back in time, and now will be able to do it whenever I need my Paris fix! Thanks for your encouragement! Best of luck Christie in your 'new chapter'. I reckon that with your 'joie de vivre' you will be successful wherever you are. Enjoy Bavaria, it is a beautiful area. Hi Lisa! Thank you for your kind words! I'm getting on my flight back to Europe today, and was thinking, "So many people would kill for a chance to live in Bavaria - what an opportunity!!!" I'm excited to see how a German world impacts my perspective on life! Wow, congrats!! That's an exciting move on the horizon! Good luck with the transition! That's great that you both have jobs to go to in Germany. And congrats on your eBook! Is that a project you've been working on for a while? I just starting taking a memoir writing class, and want to write something as a personal project about my 3 years abroad in France - so I'm interested to know what your process was like! Hey Sara! Thank you! Well, I've always been blogging as a means of saving my memories, so it's something I've thought about as I've created content for the last four years! Mostly, I just had to format for ebook publishing and tailor the content to read more like chapters and for people who don't know me. :) Honestly, I think the content itself is the easiest part - just tell your story. It's the formatting consistencies and ebook tricks that take the longest! Can't wait to see what you put together! I'll miss your fun Frenchy posts every month :-( so I hope you'll be able to pull archival stuff out regularly for us to read in #AAF BUT, I'm also very happy for you that you've found somewhere to move on to that should satisfy you both, I hope you get a sports contract too. Munich is sure to be a blast, I've only ever heard great things about it. Do you know Emma from A Bavarian Sojourn? A great Munich based blog. Funnily enough I'll be in Munich on Wednesday night, just for 24 hours as the penultimate stop on my Poland, Germany road trip. It's the first time in Munich for me though I've been to other parts of Bavaria many times. I don't know if you're already there, but if so it would be funny to meet up for a beer....Good luck settling in and starting your new chapter and many congratulations on teh ebook too. Hey Phoebe! Don't worry, I'll still find France things to post monthly! I have seen Emma's blog once or twice, but will now need to study it! I'm not in Germany yet, bummer! I'm in Scotland tonight, then heading to the Netherlands for a week before making the road trip to Munich! Munich is beautiful though, but I hear it's very hot right now! Thank you for your link-up, Phoebe, it's my favorite by far!!! Awww, such a bittersweet time in your life! I do hope you love my beloved Germany. :) I've fallen head over heels for that country and wish we could've had the opportunity to live and work there, even if only for a little while. Maybe I'll get to meet you the next time (or two!) that we come over! We're planning a March visit, but nothing will be purchased or finalized until after Baby Gypsy arrives at the end of the year. I'm planning on loving it, don't worry! :) I know it's all happening for some reason or another, even if I don't get to find out what that reason is until much later! France was such a beautiful experience, in general, and I'm hoping Germany will take care of us in a way that can extend our life in Europe indefinitely. Then I can go to Paris whenever I want! :) Can't wait to check out Bayern!!! Let me know when you finalize your trip; we have a small spare room that you guys could stay in for a few nights! Any free nights do help with the budget! Thank you, Holly! I do have to admit that I'm excited about some totally fresh locations and material! Congratulations on your book! That's such a huge achievement! Also really exciting that you're moving to Germany. I am a big fan of the country so looking forward to reading about what you get up to! Hi Rachel! Thank you so much!!! You've got to let me know when you'll be in Bavaria next! I'm so excited to see what's in store! I get to Vilsbiburg in one week!! !